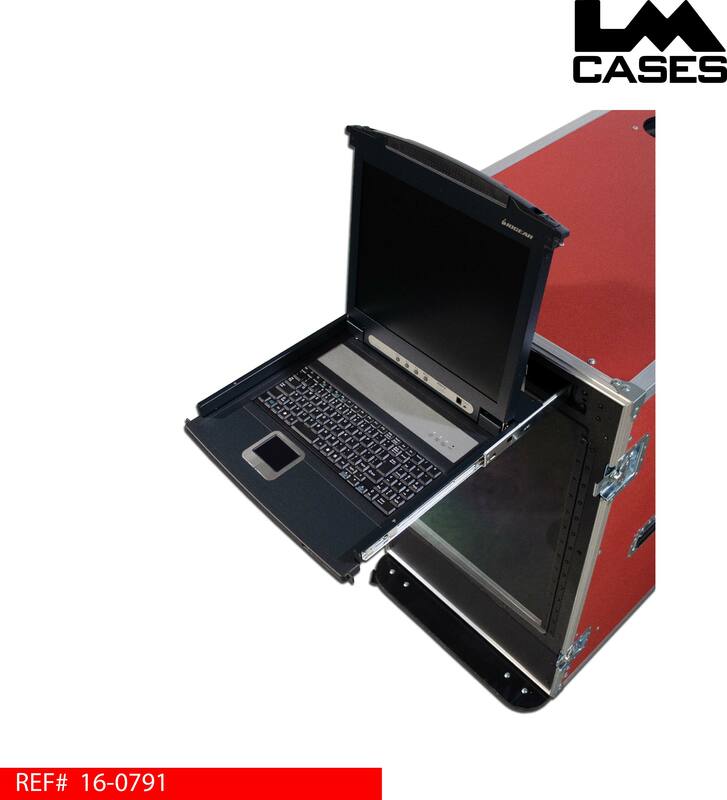 This case was designed for L3 Power Paragon as a portable solution to reduce the noise of their ruggedized servers that were being used in an office environment. 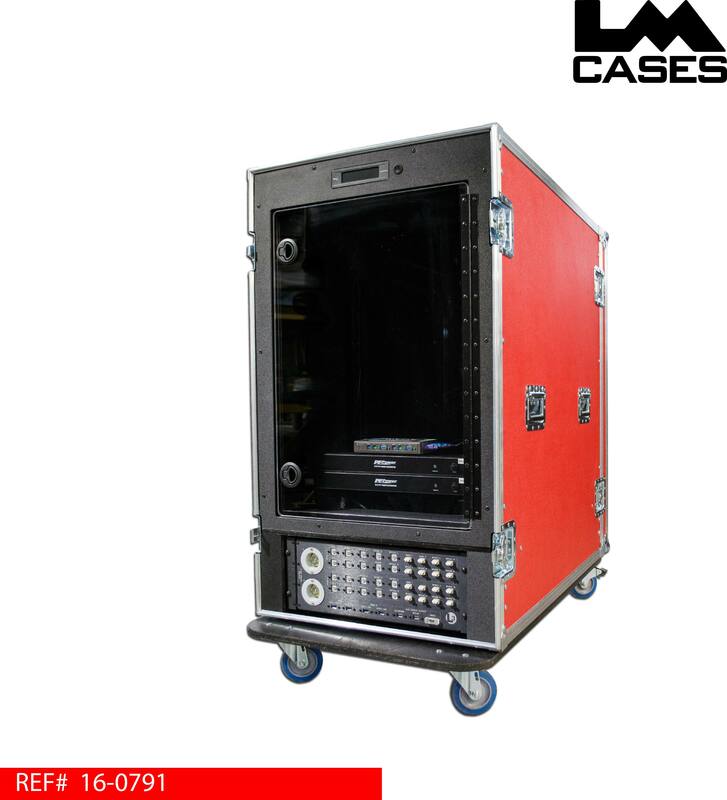 The case provides a 16RU shock mounted rack section for the servers, in addition to a 1RU LCD Console section and a 4RU patch section. The case is designed to target specific fan noise frequencies and reduce them by 15 - 20 decibels. 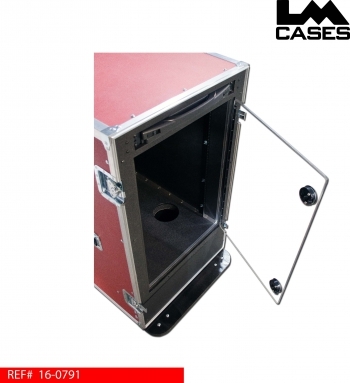 The case works by enclosing the servers and moving large amounts of air around them to keep them cool. 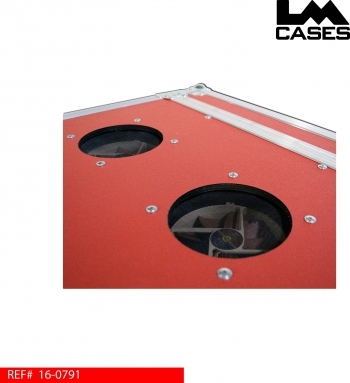 Several fans pull cold air in through the bottom and additional fans exhaust the hot air through the top of the case. Each ultra quiet fan is rated at 18 decibels. The rack section is 39" deep with 33" between the front and rear rack rails. A mid mounted dual flange combo rail is provided as a cable race way for the neat tethering of all cables. 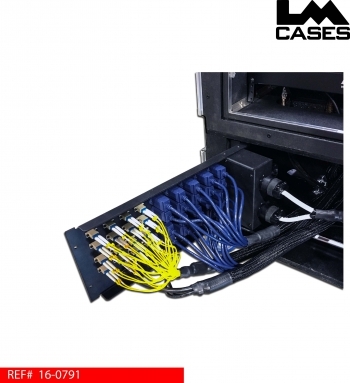 All of the connections in and out of the case are mounted on a hinged 4RU panel featuring LC fiber and Cat6 connection banks for each server. The panel also has 2 power inlets hard wired to 2 - 10 outlet power distribution units and additional USB and VGA connections for satellite video monitors. 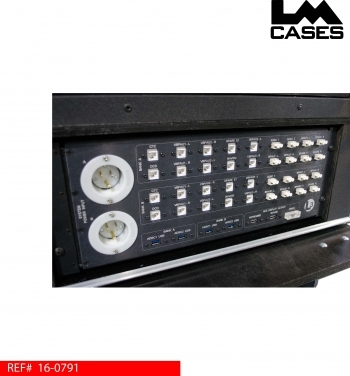 The case features a master KVM that splits the signal between the rack mounted LCD console and auxiliary ports on the rack panel. This allows the contents of the case to be controlled either by the rack mount LCD Console or external keyboards & mouse. The VGA video display output mirrors what is on the LCD console to help when multiple people are working on the system at once. The rack is cooled by 6 fans that are monitored by a touch screen controller. The controller allows the fan speed to be changed, while a master switch allows the fans to be turned on or off incase ultra quiet operation is needed. The LM Cases Custom Integration department provided and installed the rack panel, wiring, PDUs, fans and LCD console for the case. The case interior also features a accessory drawer built out of 1/2" Baltic Birch plywood. The drawer is mounted on HD Accuride glides and is finished with black texture coating. 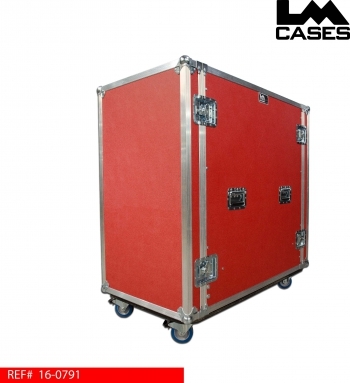 The exterior case is built out of 3/8" plywood laminated with red ABS plastic, and features deep recessed handle, pad-lockable hasp latches and Colson 4" casters. Special thanks to L3 Power Paragon for a great project!